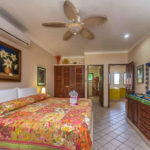 Casa Palmeras is built for comfort on the laid-back beach of Soliman Bay; and with three air-conditioned bedrooms and an air-conditioned living room, Palmeras offers year round comfort. 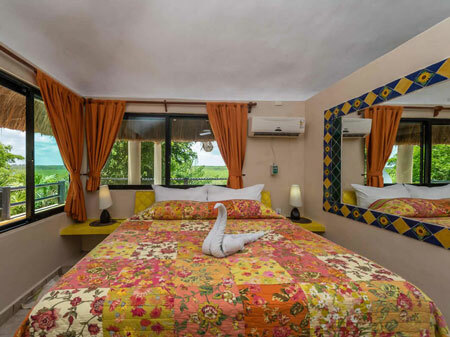 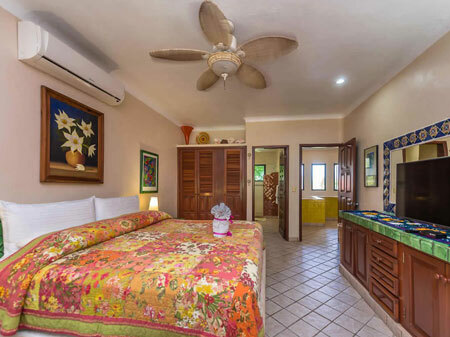 What better way to spend your vacation than staying in a classic, beachfront villa, on a stunning tropical beach, and all you ‘have’ to do is unwind; get on the sand, add some sun screen, tan a little while, do a little snorkeling or kayaking? 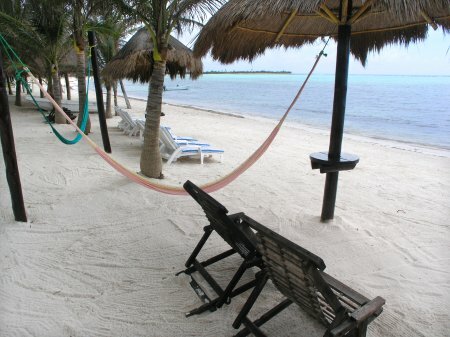 Or, maybe, ‘do nothing at all’? 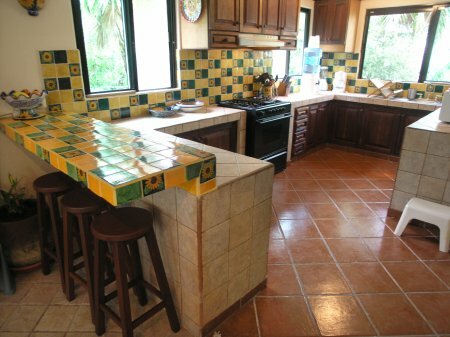 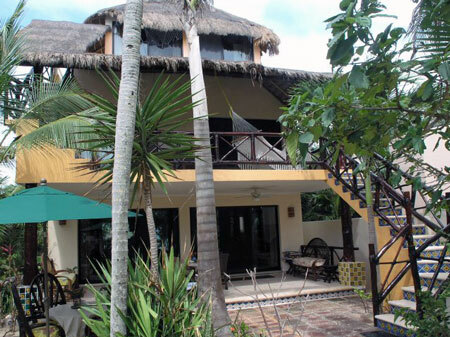 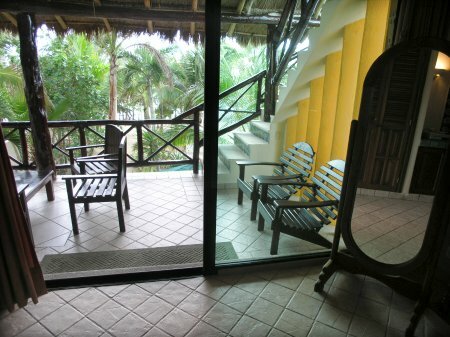 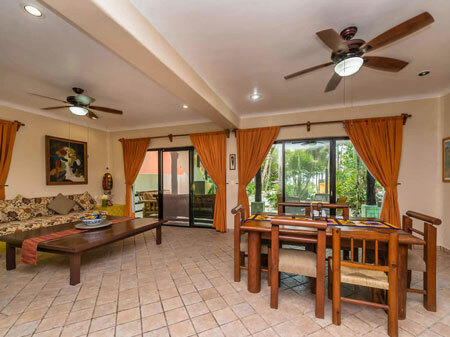 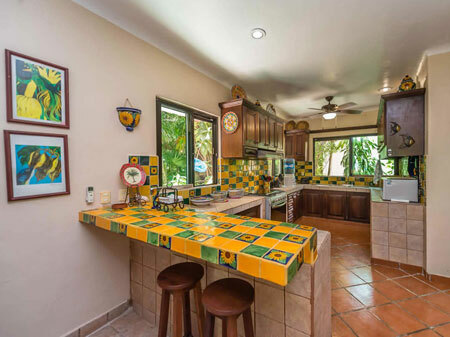 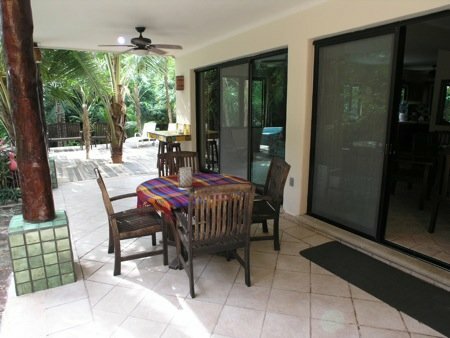 The beach level of Casa Palmeras has an open floor plan with a wall of glass sliders on the beach side. 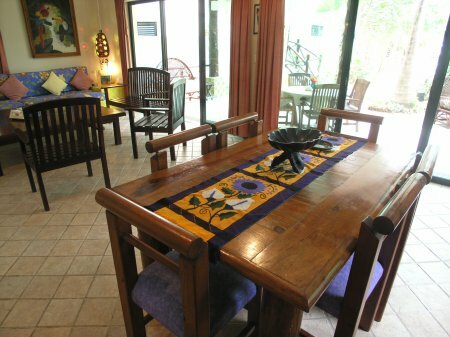 Inside, the living room has an embedded L shaped couch, large coffee table and a futon for extra bedding. 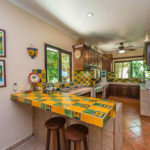 Across from the living room, the dining table seats six, and off to the right, a raised breakfast bar separates the dining area from the well-equipped kitchen. 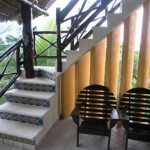 On the second level are two bedrooms, one with a king size bed and the other with two queens. 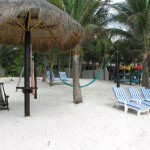 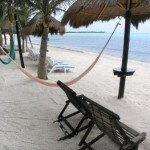 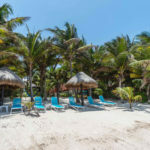 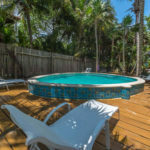 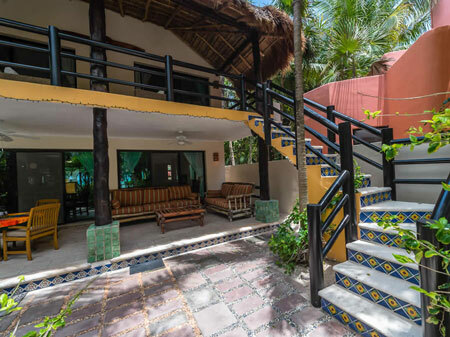 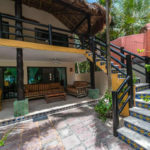 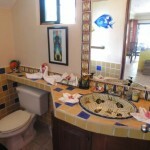 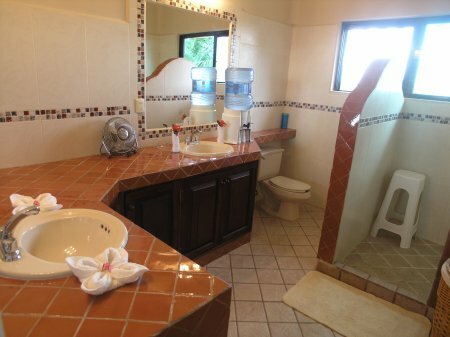 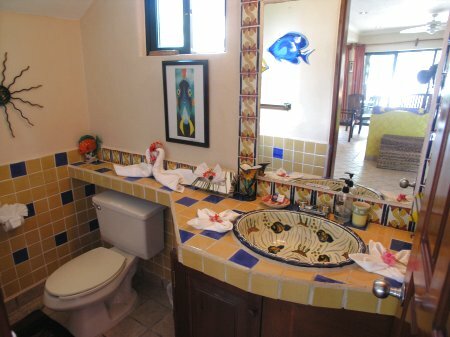 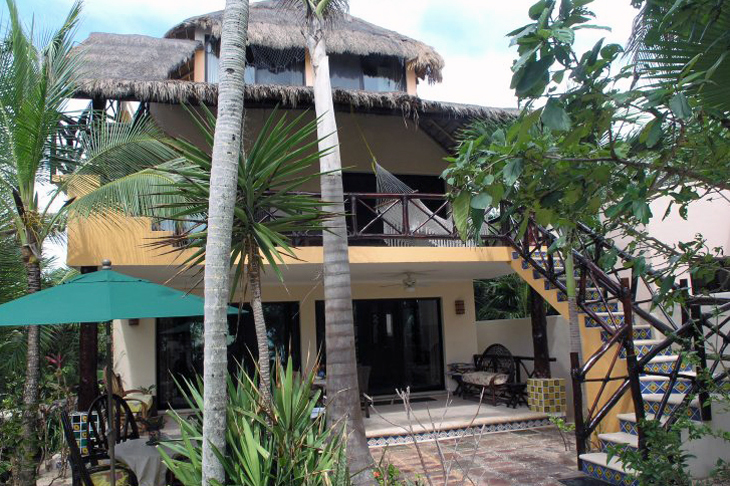 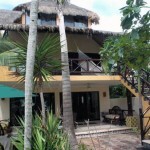 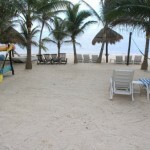 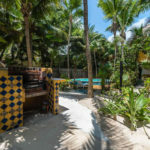 Both have a private bathroom and sliders to a shared, palapa roofed, upper level terrace that looks out toward the beach. 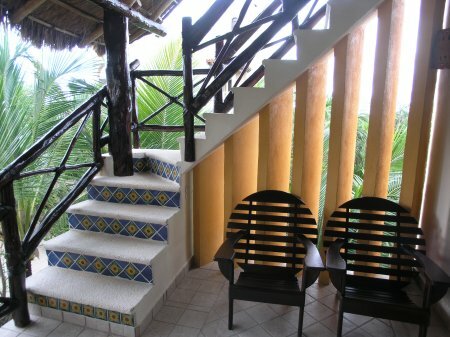 Up the next flight of stairs is the rooftop bedroom suite, very secluded, with great panoramic views. 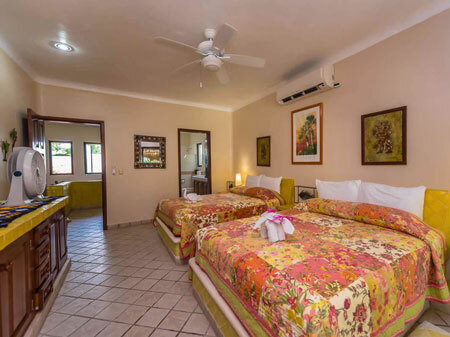 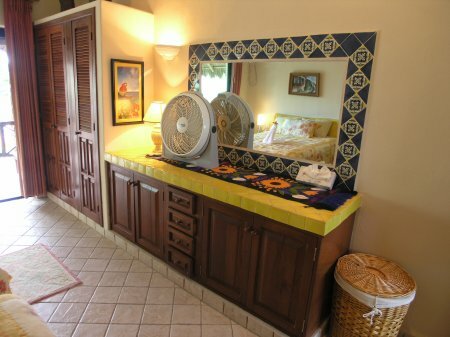 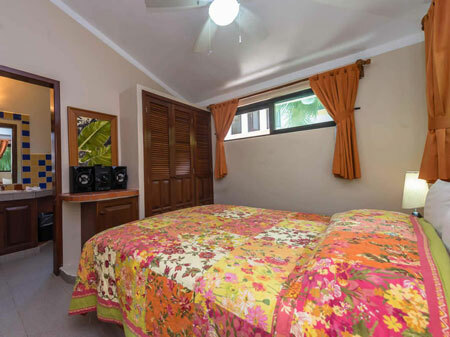 This air-conditioned suite has a king size bed, sitting area, private bathroom, ocean views and a private jungle side terrace perfect for embracing the beautiful Caribbean sunsets; and your loved one of course! 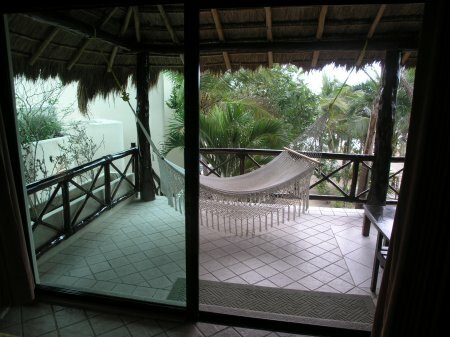 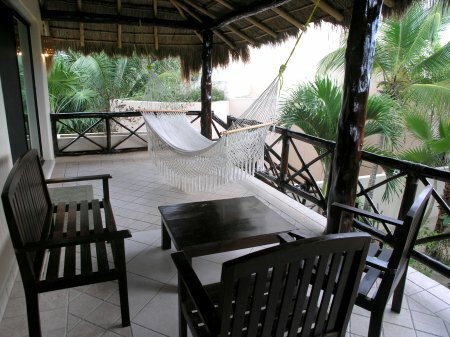 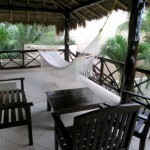 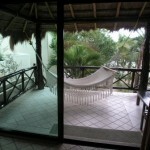 This is a wonderful private bedroom, and with the palapa roof overhead, it is truly romantic . 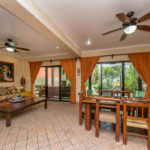 Step out through the glass sliders from the living room to a large, covered patio that is great for outdoor dining and relaxing. 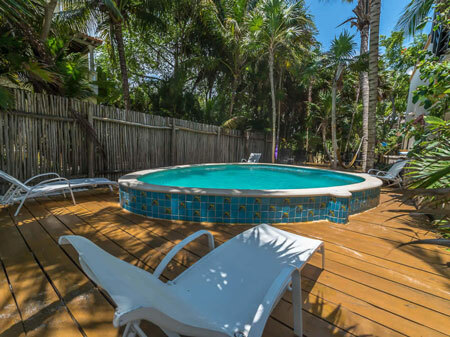 Just off of this patio is a large wood deck area that is furnished and set up purely for enjoyment, with bar seating, a swimming pool, and a little closer to the beach is a built-in grill. 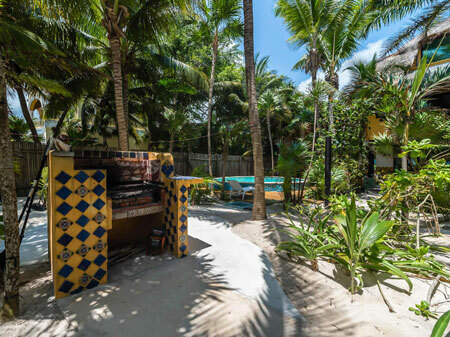 And with Casa Palmeras’ setback from the beach and plenty of shade from the coconut palms, this outdoor space is perfect for cookouts and entertaining. 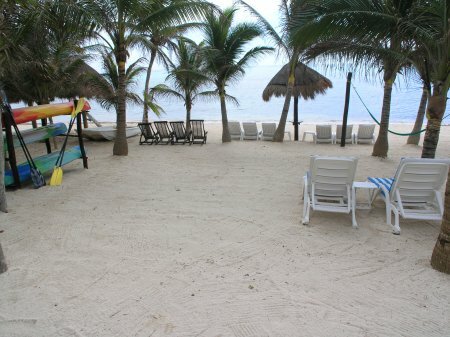 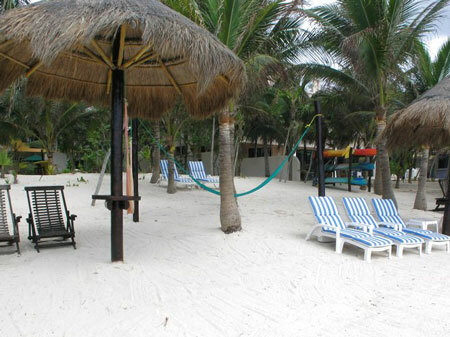 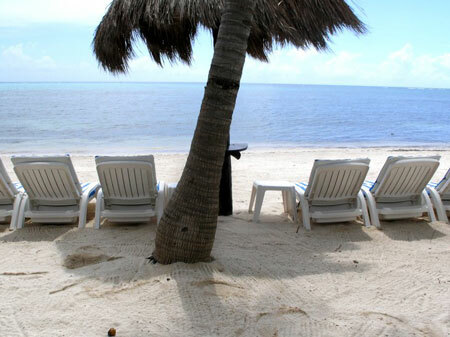 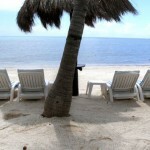 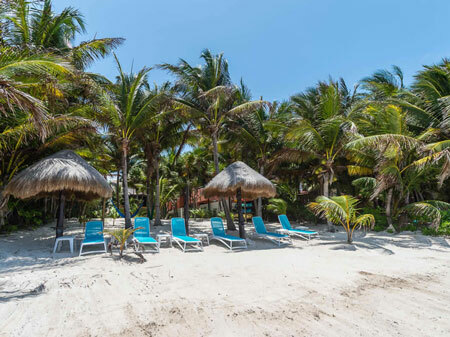 Plant yourself in a chaise lounge at the shoreline, under the shade of a palapa, with a cool, tropical drink in hand, and your worries will just roll out with the tide! 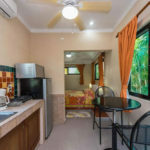 For groups larger than 8 people, a studio apartment on the street/garden side is available that will sleep 2 more. 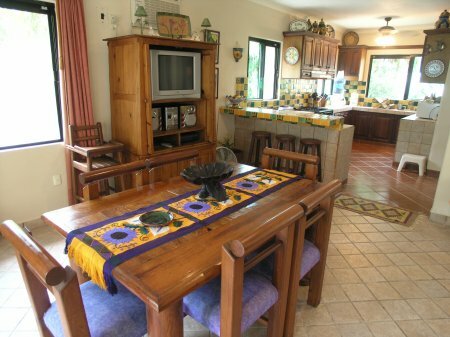 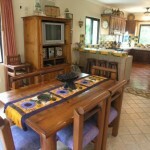 It has a kitchenette with a 2-burner cook-top, microwave, coffee maker, refrigerator, sink, and cooking/dining utensils. 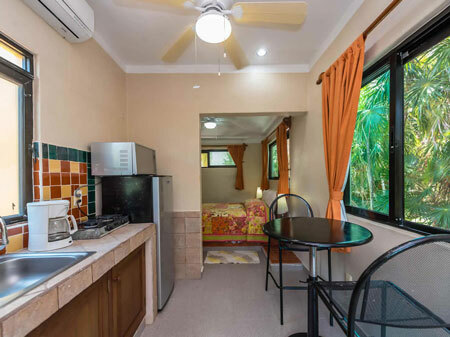 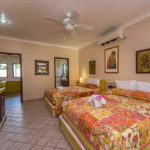 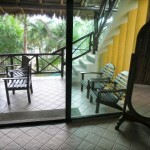 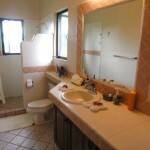 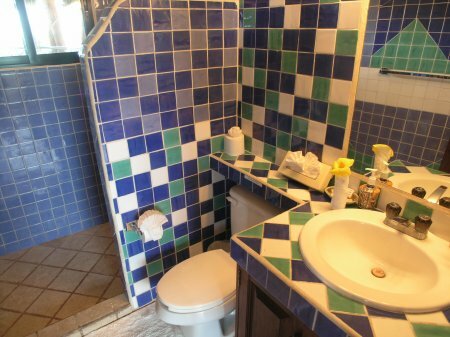 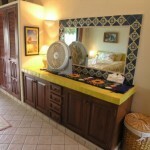 It has one bedroom with a queen bed, a balcony, two ceiling fans, a full bathroom with shower and is also air-conditioned. 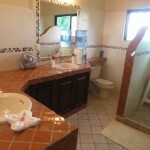 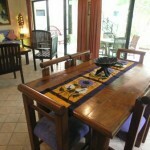 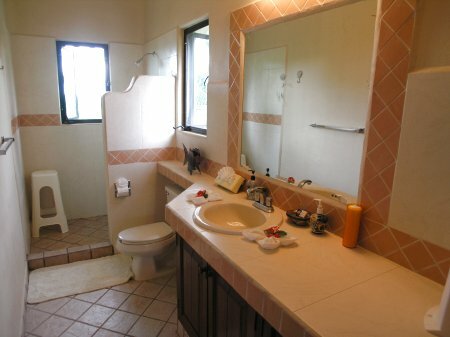 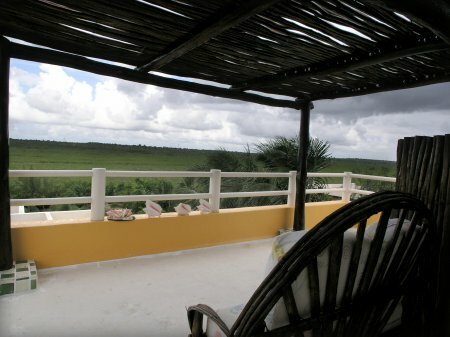 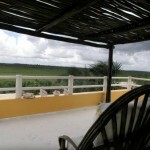 Rates are in USD, per week, for up to 6 people in main house. 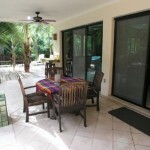 Inquire about extra person charges in main house if over 6 people. 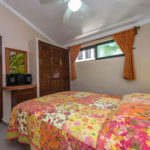 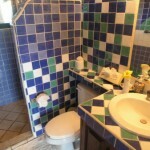 Add $500 per week for Guesthouse (sleeps 2). 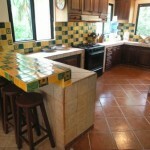 Cook service available (additional cost).